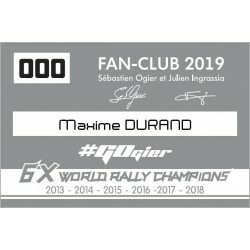 A front row seat to Seb’s and Julien’s WRC season - find out more about our Fan Club privileges! 2019 Fan Club Membership There are 3 products. 1 season for 1 Adult (+18 years old) Includes: Perfect Supporter Kit, official Newsletter, possibility to book a seat on special tours, special prices just for you in the store, special Fan Club meetings and possibility to register for the annual Fan club party! 1 season for 1 Child (under 18) Includes: Perfect Supporter Kit, official Newsletter, possibility to book a seat on special tours, special prices just for you in the store, special Fan Club meetings and possibility to register for the annual Fan club party!